As I am feeding my eardrums to this funky fresh play list provided by the Telisa D. I was “scooped” about the new IT couple that has been making subtle appearances at various “colored” events over the past few weeks. I had a hard time deciding what heading to put this post under because “And where the f*ck is your publicist” seemed so appropriate. I won’t put you out of your misery so here goes. Yes, you heard it! 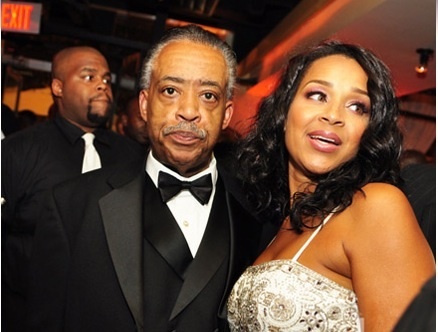 Activist and civil rights advocate Al Sharpton and actress *serving major side eye* Lisa Raye, both divorced and obviously desperate for media attention, have decided to combine their super forces together as opportunists for propaganda. Seeing as both of them have had a shaky 18 months as it relates to the media, I can assure you that this here has media molestation written all over it. Seeing as though Lisa Raye hasn’t had a leading role since “The Players Club” and her small part in “The Wood”, I find this to be no surprise. She is still incredibly beautiful and has a few good roles left in her but I don’t think this is the right route. Besides, outside of being married to Michael Misick, her involvement in politics has been very minimal. And for Al….we’ll it’s self explanatory why he chose Diamond. No Dice. And thank you to @DJWhoBTR for the tip!